Bitwig Studio is a dynamic software for creating and performing your musical ideas in the studio and on stage. Bitwig Studio features a flexible panel-based user interface; you choose what to see based on the task at hand. Switch effortlessly between three main layouts: Arrange, Mix, and Edit or see them all at once on up to three monitors. The Detail Editor optimizes audio editing by letting you make non-destructive edits within a clip. This allows you to stretch, split, pitch, pan, copy, reverse, add, move, and rearrange audio as you choose. Edit multiple tracks in the same view, isolate your view to one clip, or expand it to see everything in the entire track. The most expressive DAW in the industry. 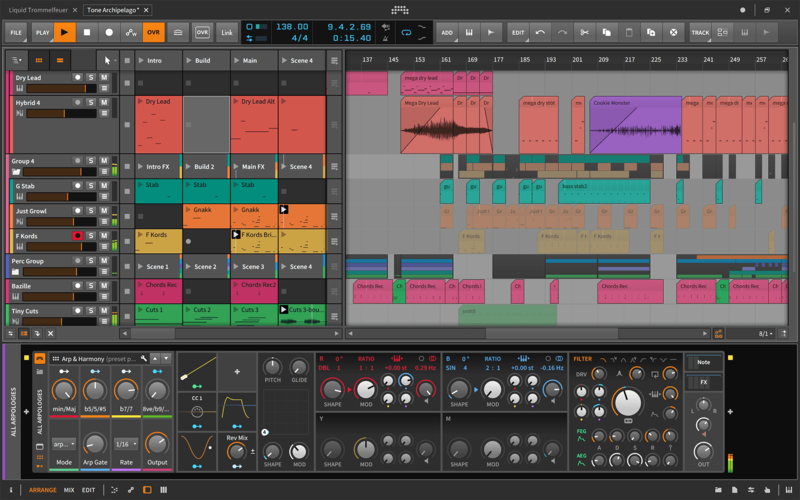 In addition to standard note editing features and per-note expressions such as Velocity, Gain, Pan, Timbre, and Pressure, Bitwig Studio features unique tools like micro pitch and sophisticated layered editing, and is a forefront runner in supporting MPE. MPE stands for Multidimensional Polyphonic Expression. By supporting the MPE standard, Bitwig Studio is among the first DAWs capable of capturing and utilizing the precise features of the most advanced MIDI controllers on the market today, such as Roli Seaboard and the Linnstrument. The bassline from your last session could be the missing piece of your current project. The rhythm section in your latest song perfectly carries over to the next. No need to close anything or dig through complex file structures. With Bitwig Studio, open multiple projects at the same time and drag-and-drop between them. Create fades and crossfades for audio clips directly in the arranger timeline or audio editor. Additionally, you can create fades for audio events inside clips—for truly fast yet flexible editing. Naturally, the curve slopes of all fades can be adjusted. Easily edit fades by hovering the mouse cursor over clip or event boundaries and then dragging the fade handle when it appears. Crossfades are automatically created when you move clips so they overlap. We speak with your hardware. Hardware integration is a large part of what makes Bitwig Studio unique. MIDI handling, note timing, and latency compensation are aspects of this. Other prominent features include MIDI Clock Sync and Ableton LINK. But where Bitwig Studio really stands out is our collection of hardware integration devices. With Bitwig Studio you get a whole array of devices dedicated to controlling your external hardware, either via MIDI and CC or CV, Gate and Clock, sent directly to your audio outputs. Always in time, always sounding great. Keep your audio material in time regardless of project tempo using Bitwig Studio's advanced time stretching. Let Bitwig Studio analyze and automatically stretch your audio, or take full control and use our advanced stretching and editing tools. Bitwig Studio comes with 8 different time stretch algorithms to cover all your musical needs, including the renowned Zplane Elastique in four flavors. Since its release, Ableton LINK has changed how musicians sync workstations across technologies, and Bitwig Studio is part of the network. Make Bitwig Studio the centerpiece—or cornerstone—of your production and performance setup. This new technology ensures everything is running in time and on the beat. The Pop-Up Browser makes auditioning and selecting Devices, Presets, VSTs, and Samples fast, intuitive, and inspiring. With powerful search, filter, and collection tools it’s never been easier to locate, or discover, the sound you're looking for. The Pop-Up Browser is nothing less than your own personal content management system. Your VST collection will feel right at home. Bitwig Studio plugs right into your existing setup. With modern software architecture, 32-bit and 64-bit VST plug-ins are natively supported, no third-party bridging necessary. We also support the VST3 standard, with per-note expressions and sample-accurate automation. Never again will a single plug-in take down your entire project. The “sandboxing” feature built in to Bitwig Studio ensures plug-in crashes will not interrupt valuable production time, or your performance on stage. Bitwig Studio protects your workflow while efficiently running your VSTs for non-stop creativity. With a touch screen and the dedicated touch display profile, the full power of Bitwig Studio is literally at your fingertips. We’ve developed complete multi-touch functionality to quickly identify gestures for the most unique and intuitive workflow ever: multi-touch support, our unique radial gestures menu, touch keyboard, and pen control (Microsoft Surface Pro, Surface Book and Surface Studio). “Smart controller“ takes on a new meaning in Bitwig Studio. Freely edit existing control scripts direct from the companies that design your controllers, or create your own. Get the most out of your gear with hands-on control of the parameters that mean the most to you, and take full advantage of every pad, knob, button, and key at your fingertips.